dBA stands for Diffuser Blocking Absorber. Our dBA panels are available in 2" thickness. Panel size is 2' x 2'and 2' x 4'. dBA is intended for wall or ceiling applications. 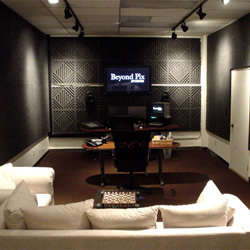 dBA is an innovative sound treatment panel for both home theaters and professional grade commercial studios. No longer will you have to struggle to figure out noise reduction coefficients or calculate the amount of sabins for a given space.